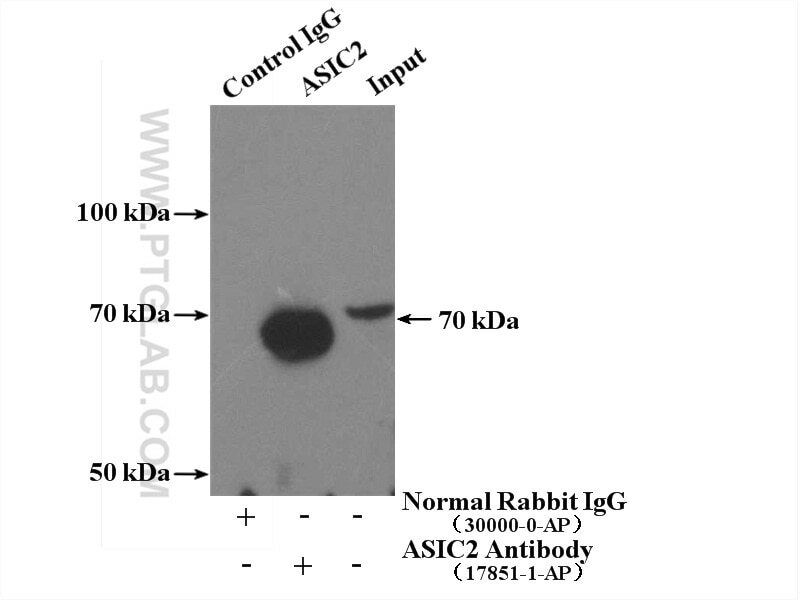 IP Result of anti-ASIC2 (IP:17851-1-AP, 4ug; Detection:17851-1-AP 1:500) with mouse brain tissue lysate 4000ug. ASIC2 (acid-sensing ion channel 2), also known as ACCN1 (amiloride-sensitive cation channel 1, neuronal), is a member of the degenerin/epithelial sodium channel (DEG/ENaC) superfamily. ASIC2 is widely expressed in the central nervous system (CNS), may playing a role in neurotransmission. It has two alternatively spliced variants, ASIC2a and ASIC2b. Syntabulin regulates the trafficking of PICK1-containing vesicles in neurons.